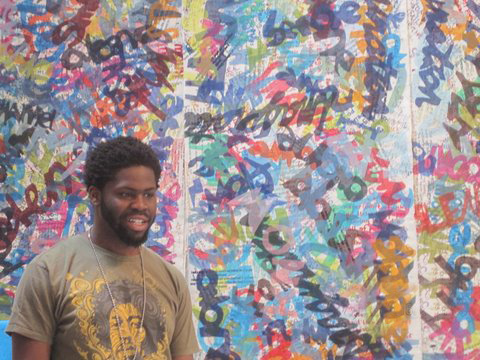 I enjoy making art with diverse populations outside of conventional art studio settings. Dyeing cloth in a library lobby, printing patterns in a church basement kitchen with parishioners, converting a corner of an art museum into a sewing center populated by teens, beading cloth with youth in a shelter—this is the terrain of the pop-up studio. With a dash of improvisation, I have been able to adapt my studio practices to build pop-up books, picture book illustrations, sculptural fiber installations, large textile collages and reach hidden communities with art. This picture book project, inspired by PORCH (People Offering Relief for Chapel Hill- Carrboro Homes), an all volunteer, nonprofit food relief organization in North Carolina stands for community and for collaboration. Planting Hope, written and illustrated with kids for kids tells a story of community nourishment. The project began when writer, Susie Wilde led a writing residency with ESL students at Smith Middle School and After-school youth at Rogers Road Community Center. Together they wrote the story of Terra and a magical seed and how they brought unity to a divided garden. Words met pictures when I introduced the writers to fabric, dye, ink and scissors. Together we transformed cloth into sky, dirt, blossoms, and butterflies. We built a watering can and collaborated on sneakers, dreams and worms. During the illustration phase of the project, kids aged 5- 12 helped fuel the creative process of making a garden grow. A picture book requires sharing the page with words and pictures. Book designer, Steve Godwin worked closely with Wilde and myself during our consecutive residencies with the children- mapping and merging text with textile. The suite of original textile illustrations will hang permanently at Rogers Road Community Center following exhibition of the project at the Frank Gallery, Chapel Hill. December 2016/ January 2017. Read more about this collaborative project in "Seeds of hope from the pens of children" published in The News & Observer. Bending Color (2005-2006), a kinetic fiber sculpture installation created with youth, families, and seniors during a textile arts residency is installed in the Orange County Senior Center, Hillsborough, NC. The residency was sponsored by The pARTnership program of the North Carolina Museum of Art, the Orange County Arts Commission and the Central Orange County Senior Center. 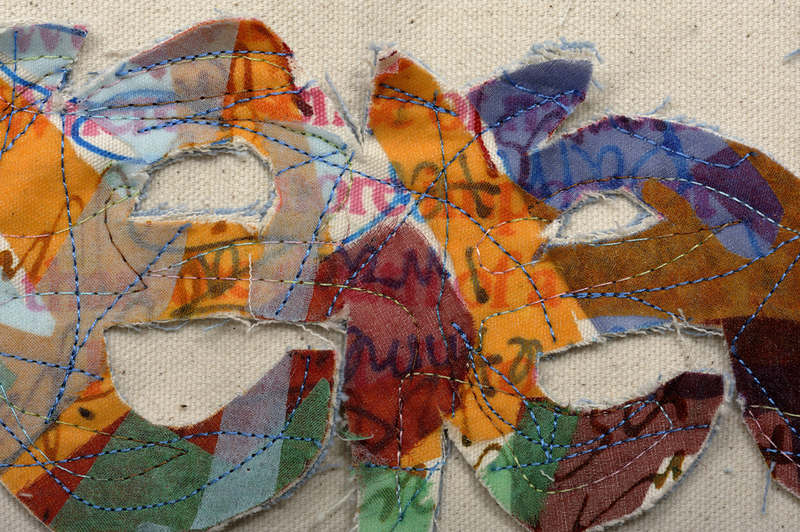 Between the Lines (2011) combines text with textile. The residency included collaborating with Sacrificial Poets and Orange County youth poets. Sponsored by Orange County Arts Commission and Chapel Hill Cultural Arts. Poems performed at Fly Leaf Books and the Frank Gallery, Chapel Hill, NC. Work installed in Chapel Hill Public Library. Wall Words (2004-2005) is a collaborative poem in cloth created with youth at the Raleigh Rescue Mission during a textile arts residency (with Harriet Hoover, assistant). The art work is comprised of two panels: 120 inches x 108 inches each. Materials include hand dyed cotton, linen, textile inks, stitching, and beads. Sponsored by Artspace Outreach Educational Program, Raleigh, NC. Sew Many Circles (2007) was created with students from the Raleigh Girls Club, Raleigh, NC during a textile arts residency. Materials include hand dyed cotton, silk and linen printed with textile inks, fused beads, and stitched circles into circles. Sponsored by Artspace Outreach Education Program, Raleigh, NC. Kids are marvelous at picturing. Hand them cloth, paper and scissors and watch inventive landscapes and characters arrive on the page. Invite them to write and edit a story and marry those pictures to words. They will. I have enjoyed collaborating with writer, Susie Wilde and book designer, Julie Hill Gignoux, on several multi-disciplinary arts residencies that have yielded published picture books created with kids for kids. Below are a few pages from What Can A Small Bird Be? What Can a Small Bird Be? Teaching Artists, Susie Wilde (writer) and I collaborated to facilitate a dual residency with NC teens to write and illustrate a picture book promoting character education for K-8 students. North Carolina Museum of Art hosted the 3 day intensive residency. Book design by Julia Hill Gignoux. Books routed to all NC K-8 public school libraries. Project sponsored by Department of Public Instruction via funding from the NC General Assembly. Tell Me a Patch is both a picture book and a story quilt created with families at Hemphill Public Library, Greensboro, NC in 2005- 2006. Story written with library patrons under the direction of Susie Wilde. 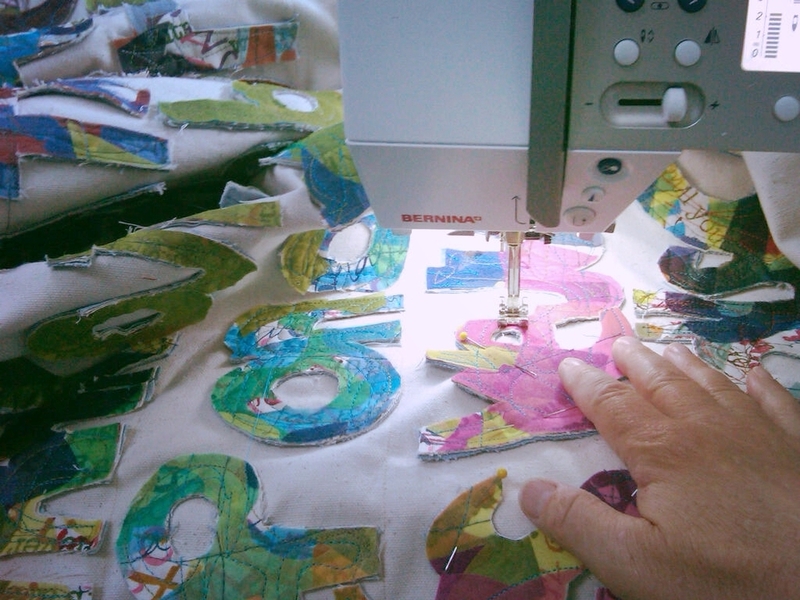 A subsequent textile arts residency with Hemphill families produced fabric illustrations for quilt and book. Project sponsored by Greensboro Public Library. Learn more about all my projects in the community.